Citrus-Lime Cupcakes with Toasted Coconut Frosting / Hey, EEP! The brilliant ladies over at Cupcakes Take The Cake run the Cupcake Meet-Up group here in NYC. As true cupcake fans - they're always finding new flavors and new ways to enjoy my favorite snack. Next weekend is the September meet up. We're having a bake sale at the Fort Greene Brooklyn Flea to raise money for Cancer Cares, an annual fundraiser "Cupcakes for a Cause." If you're free next weekend, stop by! The flea market is beautiful and there will be soooo many cupcakes :) Heaven. 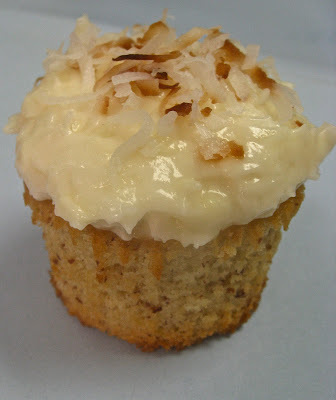 Here is my dilemma: since the weather's cooling down is a citrus-coconut cupcake too tropical? Will the shoppers like her? Would it be better to do something with pumpkin, apple, cinnamon? OH! or both? WHat are your thoughts? 1. Preheat oven to 350 degrees. Line a cupcake pan with paper liners. 2. Mix the flour, salt and baking soda together in a large bowl. With an electric mixer, beat the sugar and butter together until fluffy. Add eggs one at time, mixing in between each addition. Add the almond extract. Gradually add the flour mixture in three additional, alternating with the buttermilk. Fold in the almond meal and lime zest, set aside. 3. Divide batter between prepared cupcake pans . Bake for 20 mins, rotating the pan half way through baking. Remove and cool. 4. Make the Frosting: Beat butter in an electric mixer until smooth. Beat in the cream cheese and vanilla extract. Gradually add confections sugar until the frosting reaches your desired sweetness. Mix until creamy; fold in shredded coconut. 5. 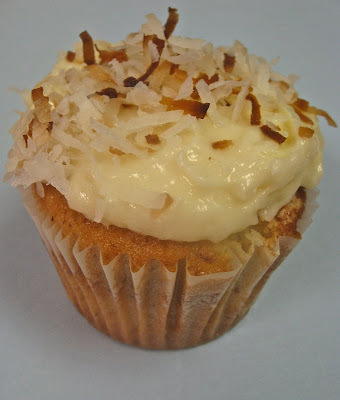 Frost cupcakes, sprinkle with toasted coconut. Enjoy! Make those! Everyone one else will be making fall-flavored cupcakes, the tropical ones will be a nice change. Plus- they look amazing. If I was going, I'd take her home with me. I tasted them before your coworkers thank you very much - and they were soooo damnnn goooddddd. I bought one of these delicious cupcakes at your fundraiser and can happily confirm that they are one of my favorite cupcakes to date. The combo of almond and coconut quite yummy! Good job Food & Femininity.